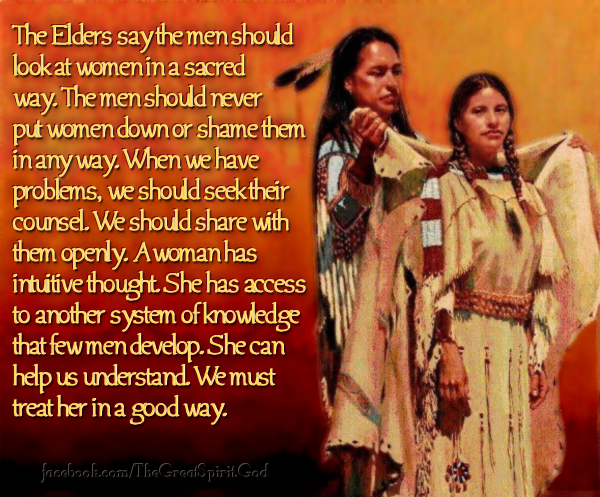 The Elders say the men should look at women in a sacred way. The men should never put women down or shame them in any way. When we have problems, we should seek their counsel. We should share with them openly. A woman has intuitive thought. She has access to another system of knowledge that few men develop. She can help us understand. We must treat her in a good way. Great Spirit, let me look upon the woman in a good way.